This was the top of the line for Harley-Davidson customers in the 30s. Produced from 1930 to 1936 it was available as a solo model, with sidecar or as a package truck. Harley’s 74 c.i. VL could do it all. They were very popular during this time period. 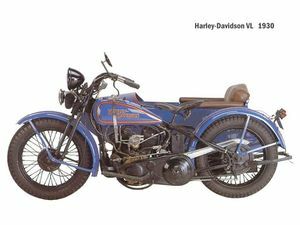 By 1937, all Harley-Davidson's flathead engines were equipped with dry-sump oil recirculation systems similar to the one introduced in the "Knucklehead" OHV engine. 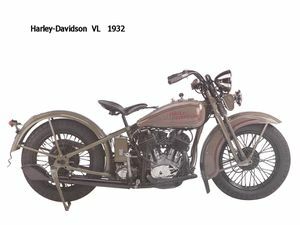 The revised 74 cubic inches (1,210 cc) V and VL models were renamed U and UL, the 80 cubic inches (1,300 cc) VH and VLH to be renamed UH and ULH. This page was last edited on 19 August 2010, at 13:05.